The Gretsch Energy Series is exactly what you’d expect from a less than $1000 set. It’s a complete 5-piece set of good-quality units, the hardware is included. This is the only kit in the list that’ll come with cymbals, usually they are purchased separately. However, Gretsch put together an awesome deal for you. The cymbals provided with this set are Sabian SBR cymbals and they’ll do just fine. The kit comes in a standard size: a deep 22” bass drum, 10”and 12” mounted toms, a 16” floor tom and a 14” snare. This is the perfect setup for any kind of music style. The snare is made out of maple and sounds amazing, so does the rest of the kit. Gretsch additionally sprinkles a few other unique-to-Gretsch features throughout the Energy series. For example, toms are cut with 30-degree bearing edges and receive five lugs (rather than the standard six found on different brands). Every piece of the setup is beautified with the delightful teardrop-formed Gretsch lug, which, as we would like to think, is still one of the prettiest lugs around. The hardware on this kit is not the best, but still pretty decent for its price. You can’t expect much from the hardware when you buy a complete kit. The stands are double brace chromed and they can take some heavy hits. As for the snare, the stand is simple to use and pretty sturdy. The toms are ball mounted and they can be configured in endless possibilities. The bass pedal and hi-hat stand seem sturdy, but if you’re looking for a speed bass pedal, consider upgrading it right away. The shells are made of poplar instead of maple or the combination between the two, this is fair since the price range is quite low. The Gretsch heads on this set are decent, but if you want achieve the professional sound you should definitely consider upgrading the heads. This won’t cost you a lot. However, the overall sound of the set is great, especially with upgraded heads. We can safely say that this kit is well suited for live plays, studio recording, and practice. Configuration: 22″ x 18″ virgin bass drum, 10″ x 7″ tom (five lug), 12″ x 8″ tom (five lug), 16″ x 14″ floor tom, and 14″ x 5.5″ snare (eight lug). Shells: Poplar with natural interiors. 30-degree edges on toms and bass drum. 45 degree edges on snare. Hoops: 1.6mm on snare and toms; metal hoops with wrap inlay on the bass drum. Finish: White wrap. Also available in Black and Grey Steel wrap. 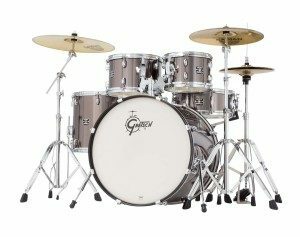 Hardware: Gretsch Energy medium-weight hardware pack (double-braced stands): boom stand with tom holder; straight stand with tom holder; snare stand; hi-hat stand; and single-chain bass drum pedal. Cymbals: Sabian SBR cymbal pack (sheet brass cymbals): 13″ hi-hats, 16″ crash, and 20″ ride. 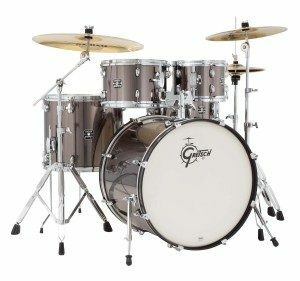 Overall Grade : The hardware and the heads on this set are decent, everything else is of very good quality and this is a good set to begin with if you’re looking for drum sets under a $1000.